The Kentucky Derby always features a host of B-List contenders who jump on the A-List on Derby day. This week, Race Talk's Girl Next Door, Angela D'Amico says Alpha isn't a beta horse, while Managing Editor Brian Zipse says Bodemeister will live up to his famous name! 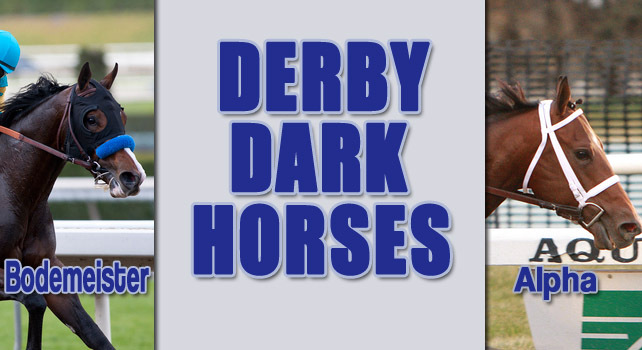 What does it take to be a Derby winner? How about a horse bred by Darley to love the dirt and the classic distance? That’s right, Alpha by Bernardini, was bred with the first Saturday in May in mind. He was bred to love the dirt and to have the stamina to handle those long runs. Alpha shares his sire with another Derby contender that everyone was marking as a favorite until he was sidelined, Algorithms. Getting to the first Saturday in May is half the battle; the road is harsh and many horses become sidelined before they reach the starting gate. It happened to Uncle Mo, and this year has seen Algorithms, Out of Bounds, and others sidelined, but with the path taken by Alpha he should have no problem getting to the starting gate. He has been a lightly raced colt, winning just enough graded stakes to make sure he has the money but not pushing himself too much prior to the big show. His next start in the Wood, win or lose, is a great place for him to run next. With the most prominent names heading elsewhere, this race will give Alpha the chance to get in a paid work and get used to the starting gate (which seems to be his main issue). This little colt is steadily improving. He finished 2nd in the Champagne stakes to Union Rags, not bad for his second race ever! Then due to his gate issues he finished 11th in the Juvenile, but he then came back to win the Count Fleet. He had no easy trip in the Count Fleet bobbling at the start and going wide around the turns, but he still managed the win with an 85 Beyer Figure. In his race leading us up to the Wood Memorial, he went a 1 1/16, with a higher assigned weight than the competition, went about 4 wide around the turns and still earned a win with a 90 Beyer. I like what I see…improvement. Although the jockey on this winning team for the Derby is yet unknown, the idea of losing Ramon doesn’t bother me one bit. As a matter of fact, I am thrilled with the idea of Ramon riding Hansen over all of his many, many other mounts. This leaves the possibility of Alpha being wide open for a fast healing Garrett Gomez. Just a thought, but he does have a past with this horse. I know the outcome of that race was not what I was betting on, but since he was already knows the colt a little bit, McLaughlin may as well have the best rider out there on his horse. I think that the pick up mount - Derby win angle, started last year, could become a trend. I know we keep hearing about Union Rags and Hansen, but don’t leave Alpha off of your Derby tickets. He is flying under the radar right now, and we may just get a great price on this future Derby winner. That’s a good question you ask, Angie, and one that is asked by everyone involved in this sport on a yearly basis. Luck may be the most important factor, but a talented horse in the hands of a master horseman can certainly improve the odds. One such horse is an attractive son of Belmont Stakes winner, Empire Maker, named Bodemeister. Named after the son of three-time Kentucky Derby winning trainer, Bob Baffert, Bodemeister is both loaded with talent and in about as good of hands as a Kentucky Derby contender could hope for. Yes, the Derby trail can be a perilous path for these young hopefuls. Not only do they have to remain a picture of health during the months leading up to the first Saturday in May, but they also need to collect enough in graded stakes earnings to qualify for the 20 horse field. For good or for bad it seems like a lightly raced horse that can peak in the spring, is now the popular way for a horse to reach Louisville. Both of our choices have some work to do on the earnings front, but I am confident they will take care of that in their next outing. Whether it is the Santa Anita Derby or the Arkansas Derby for Bodemeister, I am expecting a big effort. After a solid 2nd place finish in his January debut, Bodemeister left many a jaw dropping with a stunning maiden victory in his second start. Arguably the most impressive 3yo performance so far this year, he absolutely ran away from a promising bunch of maidens in 1:34.45 for the mile. It was the kind of a performance that you see from a special horse, but he would need to show he could do it against stakes horses, and for the most part he did that in his next start. Running in one of the deepest prep fields so far, Bodemeister proved his class with a solid performance in the Grade 2 San Felipe Stakes. He was a little green in the stretch, but I saw it as a perfect progression for a talented young horse clearly on his way up. 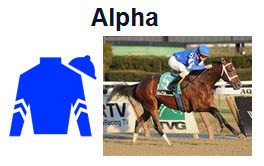 Alpha not only had a chance against the best in his generation, but he had it around two-turns at Churchill Downs. Excuse or no, he failed. He reminds me of Stay Thirsty (also by Bernardini) in that way, and we all know how he fared in the Derby. Meanwhile, Bodemeister has only had one chance against topnotch competition, and he ran a very promising race. Sure he did not beat Creative Cause that day, but he was competitive and much the best of the rest, and all this in only his third lifetime start. At this stage of his career, there is plenty of reason to believe he will improve with more racing, and considering the trajectory of his first three starts, that should be more than just a little bit scary to his competition. I agree. While the likes of Union Rags, Hansen, and Creative Cause are looking good and currently dominating the Derby chatter, the 2012 trail seems to offer a plethora of other interesting prospects, and for the reasons outlined above, I like Bodemeister as well as anyone of that bunch. See where your favorites rank in HRN's Kentucky Derby 2012 Contenders! Alpha's numbers are a little low but personally I think he looks great. 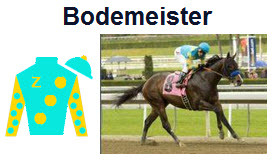 I'm not a huge Bodemeister fan but I can clearly see he has a lot of room for improvement and is very talented. Right now I think Alpha has an edge with his experience and foudation. The kiss of death, comparing Alpha to Say Thirsty! Of the two, I prefer Bodemeister, but Gemologist is the one I really like. Love his chances to beat Alpha in the Wood. sorry folks meant to say Aplollo(1882 derby winner) not Alpha!!!!! with all of that said,I would be wiiling to bet a million that Bernardini will sire a Derby,Preakness and Belmont stakes winner...and possibly the next triple crown winner,it's just not going to be Alpha! Are you kidding me???...Bodemeister!! !...History is not on his side for the Derby,as most of you know,no unraced two year old has won since Alpha...1882.However,his remarkable speed could still earn him show money or possibly 4th...on the other hand Alpha could finish somewhere between 10th and 15th!..I know Im jumping ahead here,stiil has to run in the SA Derby against that underrated hoss...Creative Cause,and the little talked about I'll Have Another ! !...Those three would be a wise trifecta (boxed) in that race.If all goes as planned for bodemeister,look for him to greatly improve headed toward the preakness,and could be the one to upset another triple crown hopeful.Although pedigree is not an exact science,Bodemeister's daddy Empire Maker is a Belmont Stakes winner....somewhere down the line,Alpha will be winning minor stakes races. Not impressed by the apparent lack of confidence from McLaughlin but have loved Alpha from the start> Thought he and Secret Circle had the two most dominating maiden wins of the summer. I know he is looking like a bit of a grinder, but that steady grind is likely to look pretty fast between furlongs 9 and 10 come Cinco de Mayo. Hey, Mine That Bird won the Derby. So why not one of these two? The steadiness of Alpha or the Brillance of Bodemeister?